The purpose of this blog is to share our opinion on how to use XTackle products, product updates and what is going on in the fishing world. Our hope is that you will find some of the data here helpful. So we took the prototype baits fishing, and they performed well, Very-Well, and the baits ran true. There were a couple of minor issues, all related to being hand glued (BB’s got stuck in the back chamber once in a while…). But overall we were very happy with the bait. We got the larger bait (hint) to dive down to 27’ with 225’ feet of 10lb mono out, 25’ at 200’ of mono. And yes, they caught fish, the largest being a 29” Walleye, not too bad for its first time out on Mille Lacs. The baits continued to have success around the upper mid-west this fall. On to the next step, selecting the colors and getting them painted. We sent off a pile of baits and waited to see what we got back. We were pleasantly surprised how well the samples turned out. The chrome was great, clean and bright and about 60% of the colors and patterns were right on and the others were directionally close to what we wanted. Time to kick off production: So here is what we are starting with, 35 standard colors (in the picture above) and 29 customs for our first run. We have another 30+ colors that will come later in the spring to early summer and we have another 50+ on the waiting list. So plenty of colors, and we will be adding all the time. What we haven’t talked about yet is we decided to build 2 sizes to start with, one 6” (MSRP $7.19) and one 4” (MSRP $6.99). The Next step Build a Prototype, how hard can that be? So, now we know what we want. Off to design and then the prototype Shop. Let’s draw it out, and see what we get back. After several weeks we get our first sample, I was a little surprised at what I got back. The first thing that I found odd is nowhere did I ask for gills, but sure enough there they are. Seeing it live, we don’t really like the shape, it was too skinny and not a fan of the bill. I also didn’t request 3 hooks but I got them (to be fair to the designer, I didn’t ask for 2 either). Personally I’m not a fan of 3 hooks on a bait, they always get stuck in the net. So, we changed the shape of the bait, took away a hook and added more mass to the bill. We waited several more weeks to see what we get back this time. This time, the bait looked a lot better. No gills, and the change to round out the bait was the right choice. They also hand added material to the bill to get it the way we wanted it. This bait was really close to what we wanted, but still a little off. They held off on hooks and eyes as they can be added later. So, with all the feedback in, we turned the crank one more time hoping this would do it. We also had decided on how many rattle chambers we would have and where they should be. We also wanted the ability to put an internal prism in the bait, so placement was the key in order to get the largest prism we could in the bait. Back to the proto shop. We wait several more weeks and we got back prototype 3. This is the final outline of the bait we built. The bill was right, we dropped the back just a little. We all agreed on the placement of the center hook. My first thought was “Great we have a shape”. Now let’s put it in the water and see what we have. I want to test it ASAP and I thought, where can I test this quickly and get good video? I know my health club has a pool, I’ll go there early in the morning, ask the person at the front desk if I can quickly run this bait in the pool and check it out. Luckily they said no one’s in the pool go ahead. I put it in the pool and I knew right away this bait was a winner! Tight fast wobble, and dug deep really quickly. What was really surprising was how loud it was. I could hear the rattles pulling the bait in 3’-4’ of water in the pool, it was crazy loud. We quickly decided this is it, we have what we want. Now let’s go build a mold. Tick-Tock, more time goes by and the day comes when we got the first parts off the mold. They are hand glued and clear but we have them. So, now where can I run them quickly? Good thing we have friends! My buddy Tim knew someone with a pool close by, so off we went. This bait ran true, even hand glued, nice tight wobble and the final bait was really loud. Next step is get out the sharpies and WTP tape and take them fishing!!! XTackle has some exciting news that we will be sharing more details about it over the next few weeks and months. After several years of designing testing and tweaking we have built our own Crankbait line that will be available in the spring of 2019. First off I would like to thank the great lure companies, specifically Reef Runner (the Stecher family) and the Storm family for working with us over the past almost 20 years now. Together with these to great family’s/Lure designers, we have designed 100’s of great lure colors that to this day catch fish and win tournaments. 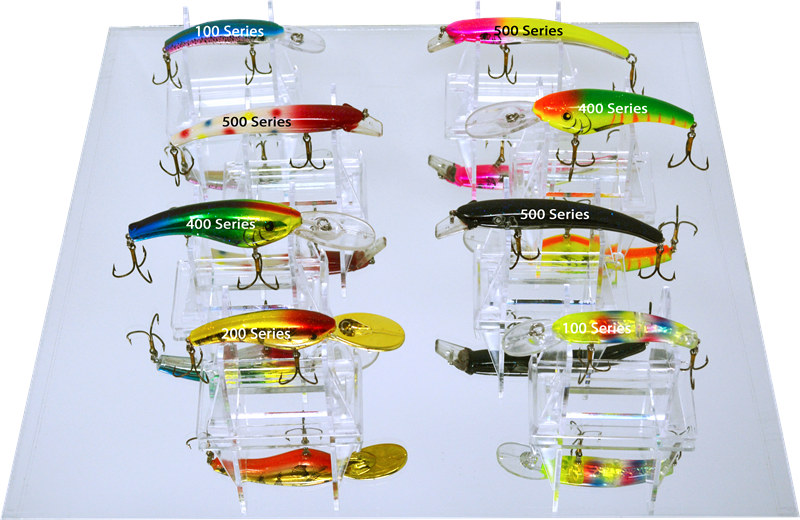 The characteristics of these baits are complementary to the Reef Runner product line. It has a very different action and noise profile from the Reef Runner Minnow baits. This has been an interesting process (at least to me), and it was a lot harder and took a lot more time than I would have ever thought. There were many reasons why now was the time to build our own bait and I will get into that later. But before we started the design we had set a simple goal for the baits. Build a high quality Bait that catches fish, that we would be “proud” to put our name on. You get one shot for people to trust you, make it count. The next thing we did was to decide what characteristics do we want out of these baits. Loud, “really” loud in every direction (Starting/Stopping/running side to side). Dig deep, 6” bait 25’+, 4” bait 17’+. Run true out of the package. The Paint had to be second to none. We would build great standard and custom colors (lots of custom colors) and not charge more for the customs like we have been doing the past 18 years. Continue to work with our customers/fisherman on new colors that catch fish. Use high quality hardware (Hooks, Split rings, and wire forms)We needed split rings what could support this new stronger hook that wasn’t massive in size. Sounds simple but in the end we had to work with a hook manufacture to build us a custom hook that meet our needs.We wanted a wide gap treble, it had to be strong, has to have super sharp points and we wanted Nickle metal black plating. The wire forms need be strong and with enough material around them to not pull out. Build a high Quality bait. Ultrasonic welded 2 part body (no glued in bill). Make the bill strong enough that you can pull that walleye out of the water without the bill snapping off. (Yes we know you do this and Please don’t test this to its limits J ). Build several rattle chambers into the bait so it always making noise. Use an internal prism with texture so it would reflect better. Have a 3D eye that doesn’t look cheap. Ultra-Smooth body that would give a glass like finish on Chrome baits. The bait was designed and assembled so they are tuned at assembly. Baits are pulled of the line and hand tested to run true, if a bait does not run true that batch will be 100% tested. We had 100’s of samples of these baits and everyone we tested ran true. I could go on for hours, but by now you should be starting to see that there is more to this hunk of plastic and hooks that there appears to be at the surface. More to come over the next few days and weeks. I have been taking to a lot of fisherman lately and it struck me odd, that when it comes to fishing their shallow water lakes, they don’t think Reef Runner. Now, I know Reef Runner has 5 baits that are great for running is less than 6 feet of water. 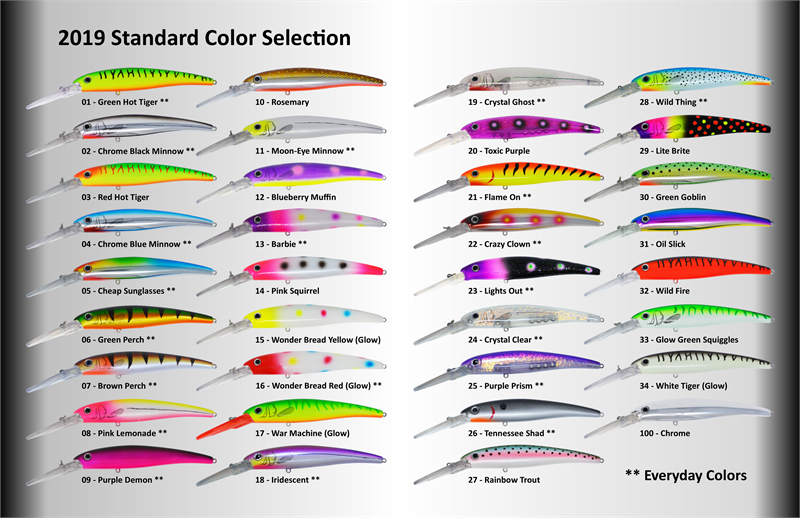 With over 125 colors for those baits they should be a go to, but it’s clearly not widely known. The baits listed below will dive less then 6 feet with 20 feet of line out. 100 Series - ~20ft of line out, puts the bait ~4’ down. 200 Series - ~20ft of line out, puts the bait ~5’ down. 400 Series - ~20ft of line out, puts the bait ~6’ down. 500 Series - ~20ft of line out, puts the bait ~3’ down. 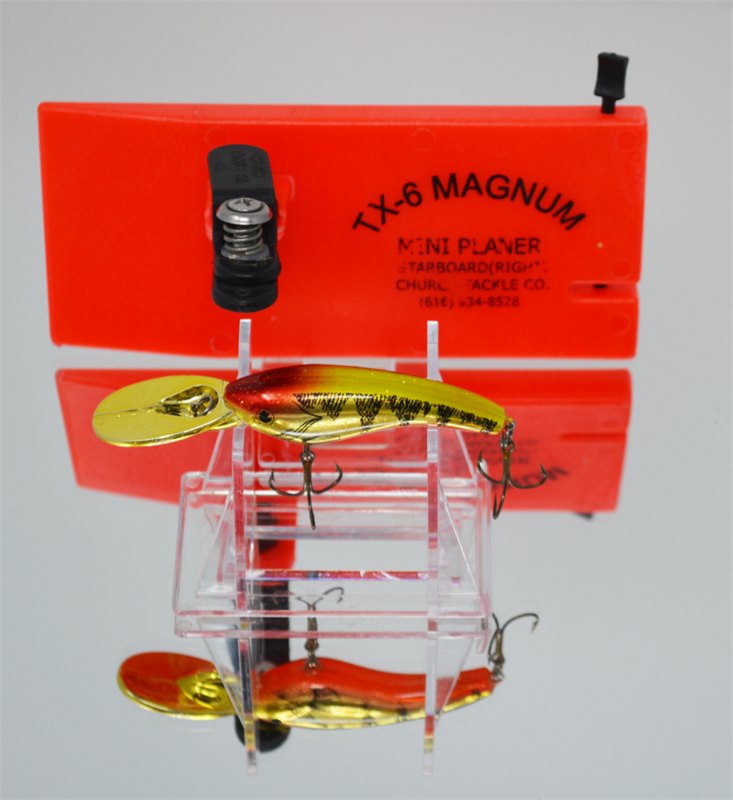 When I'm fishing shallow I'm always pulling baits behind a Chruch Tackle TX-6 Planer board. The nice thing about fishing shallow is you can typically see where the bait is running, or feel the bottom, so it fairly easy to determine how much line to put out. If I’m fishing in 5 feet of water I will typically have the bait running at 3 feet, so you may only have 10’ or 15’ of line out behind the planer board. The TX-6 is a little over 5" in length, the bait in the picture is a 200 series RipShad. Great for 100, 200, 400 and 500 Series Reef Runners. The other conversation I have had with fisherman about shallow water crankbaits fishing, is around Planer Boards. Most don’t know about the Church Tackle TX-6 planer board, and they are missing out. The TX-6 is by far my favorite planer board for pulling smaller shad baits and shallow running lures, (the 600 Series pulls a little to hard for this board). This board is the original reason why XTackle started carrying Church Tackle. The smallest of fish will pull this board back (White Bass, Small Walleyes ...), no more trying to read a tattle-tail flag. In most cases when fishing this board you have 25’ or less of line out, when a fish strikes, just raise the rod tip and pop the board out of the water. The board is light enough you get to fight fish not the planer board, it puts the fun back in shallow crankbait trolling. Another plus, if you have less than 20' of line out, in most cases you don’t have to take to board off to net the fish. So the next time you’re out fishing your local lake, give them a try, you may be surprised how well they work. If you have any questions about pulling Reef Runners in shallow water feel free to drop me a note.